Soda bread in its traditional form is a type of peasant bread. Its popularity in Ireland surged after the potato blights of the late 1840s. With the potato crops decimated and millions of the poor Irish tenant farmers starving and dying of starvation, soda bread became a common sustenance food. A simple yet hearty food made with four basic ingredients – flour, baking soda, salt and buttermilk. Irish housewives could whip up a loaf on a daily basis in less than one hour. 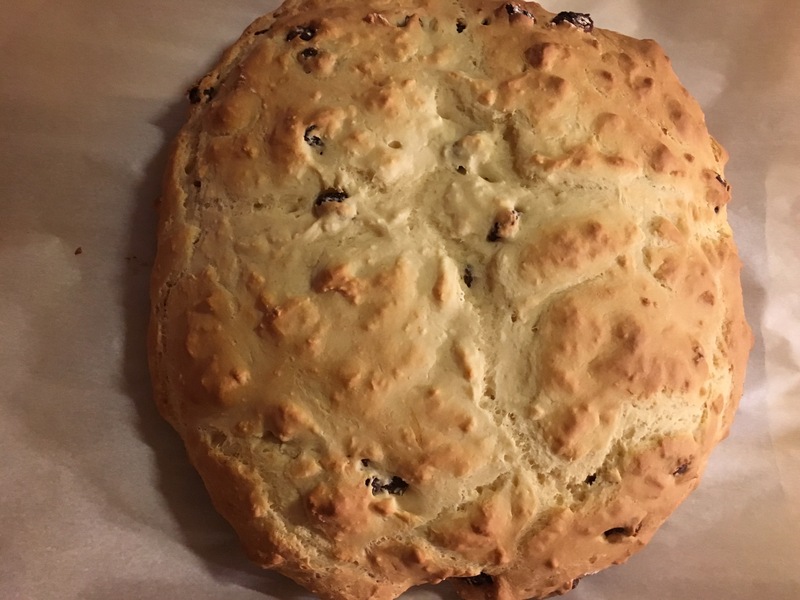 This St. Patrick’s Day, I decided I should learn how to bake Irish soda bread. 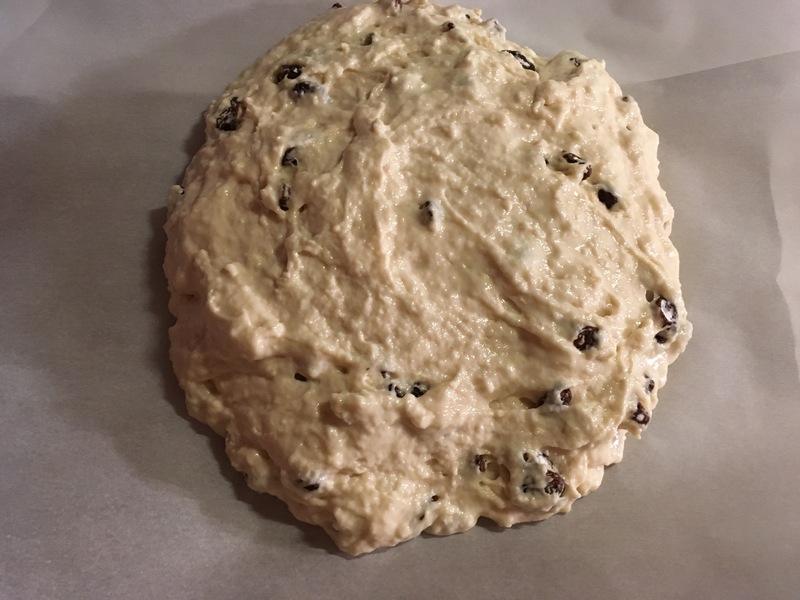 After looking at several recipes and since I had raisins on hand I baked a loaf of Spotted Dog, presumably named for the spots of raisins in the loaf. Break one egg into a measuring cup and combine slightly. Add enough buttermilk to egg so that there is 18 ounces of liquid. 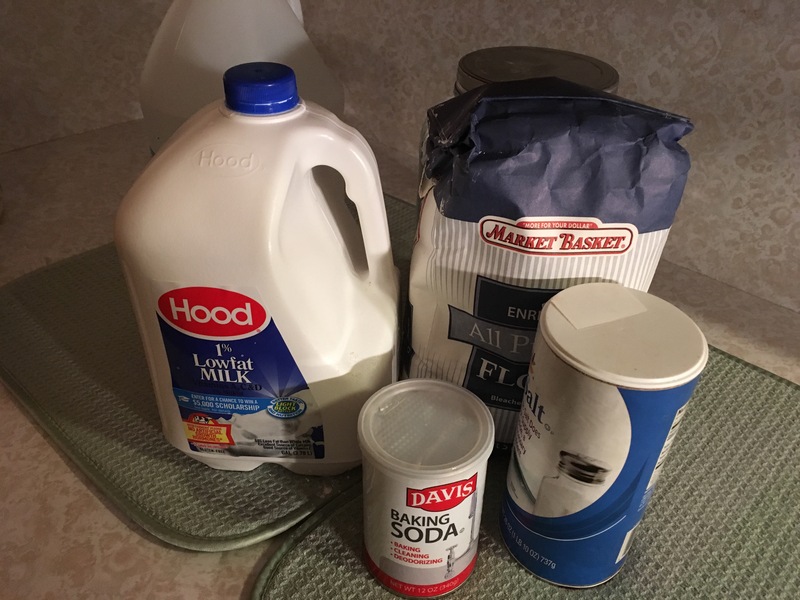 If you don’t have buttermilk on hand, a substitute can be made by adding 1 Tablespoon white vinegar to milk for every cup of butter milk needed. Make a well in dry ingredients and add wet ingredients to well. Mix dry ingredients up from the side of the bowl until completely mixed but not over mixed. 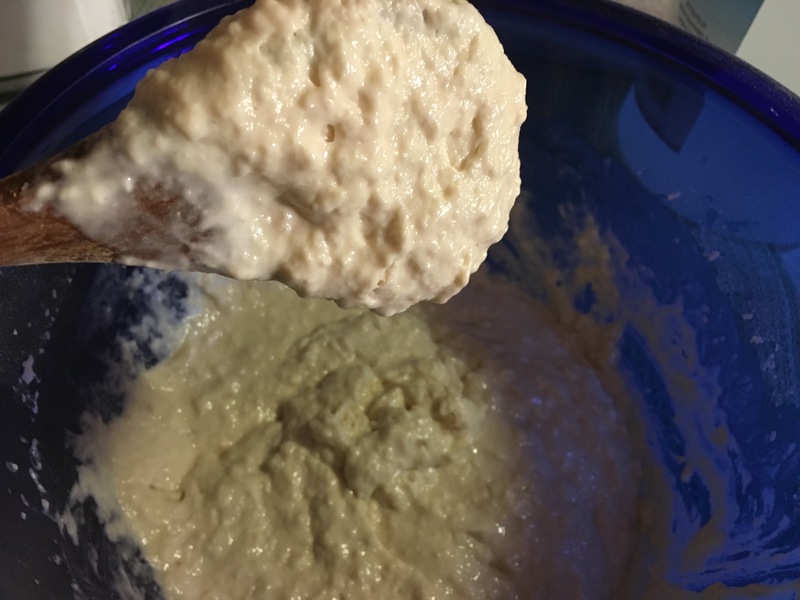 The batter should be soft but not too wet and sticky. 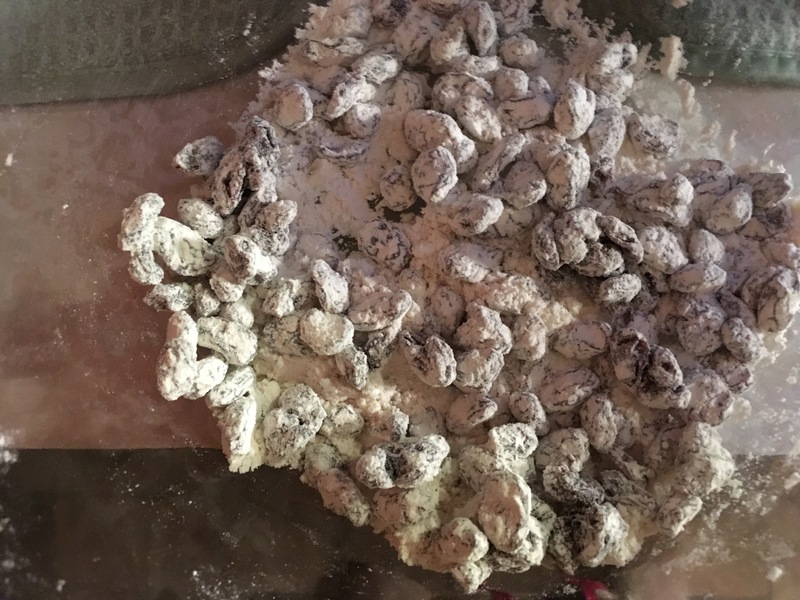 Dredge raisins in flour and mix into batter. Pour batter into parchment lined Dutch oven or baking sheet. Cut a cross in the loaf to ward off the devil and faeries. Practically speaking the cross makes it easier to break the bread apart particularly when being eaten by the tenant farmers in the fields. Place in oven preheated to 450 degrees Fahrenheit and bake for 15 minutes. Reduce the oven’s temperature to to 400 degrees Fahrenheit and bake for another 15 – 30 minutes. Crust should be golden brown and when the bottom of the loaf is tapped it should sound hollow. Let cool before slicing. Serve with butter and marmalade. Simple ingredients lined up on the counter. 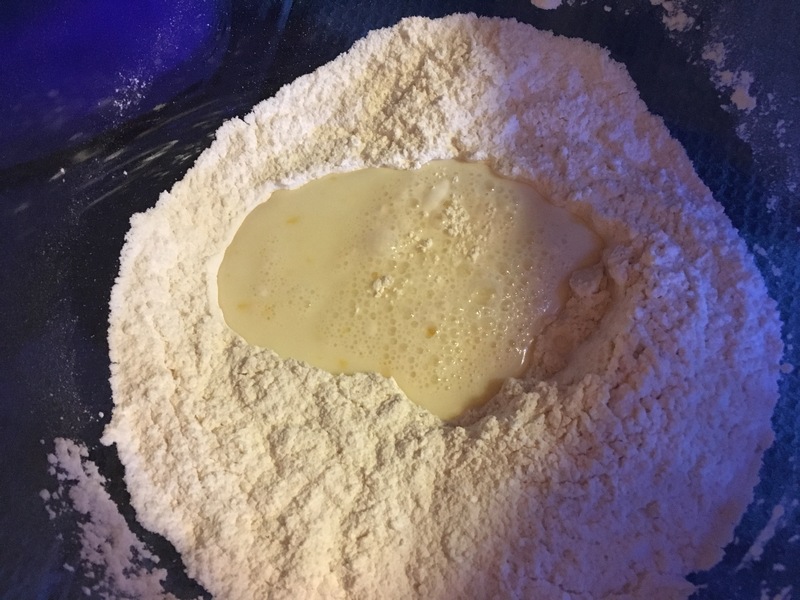 Dry ingredients with a well filled with buttermilk and egg mixture. Dry ingredients mixed up from sides until combined. 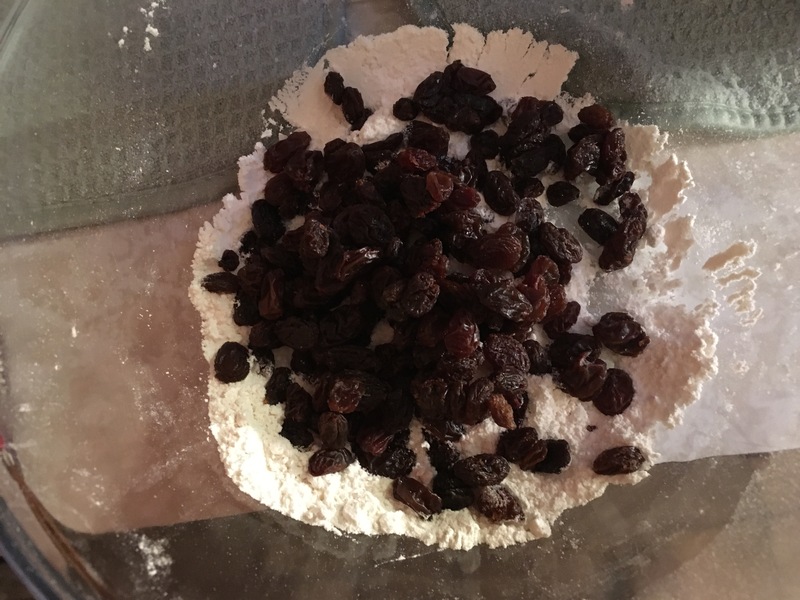 Add raisins to a handful of flour. Pour batter onto parchment lined pan. 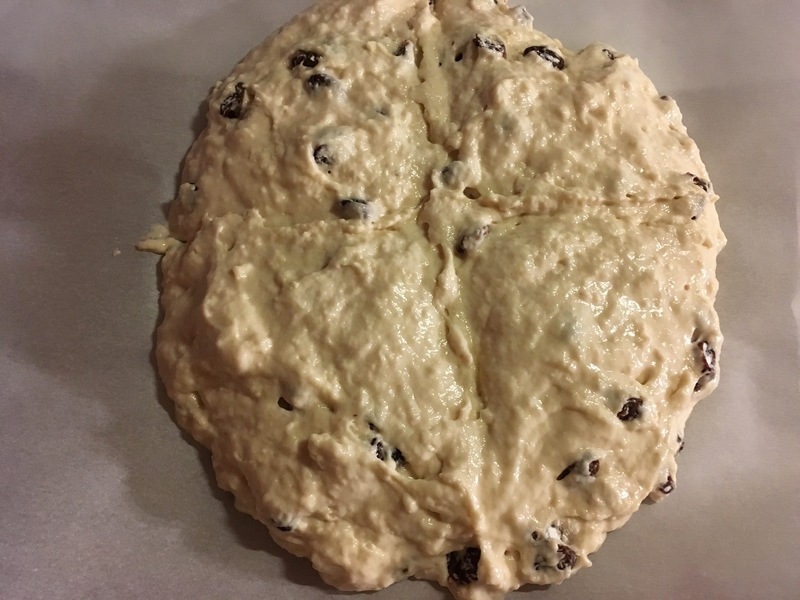 Cut cross into batter before placing in oven to ward off the devil and faeries. After baking for 15 minutes. A slice of Spotted Dog fresh from the oven and ready to be smeared with butter and/or marmalade. 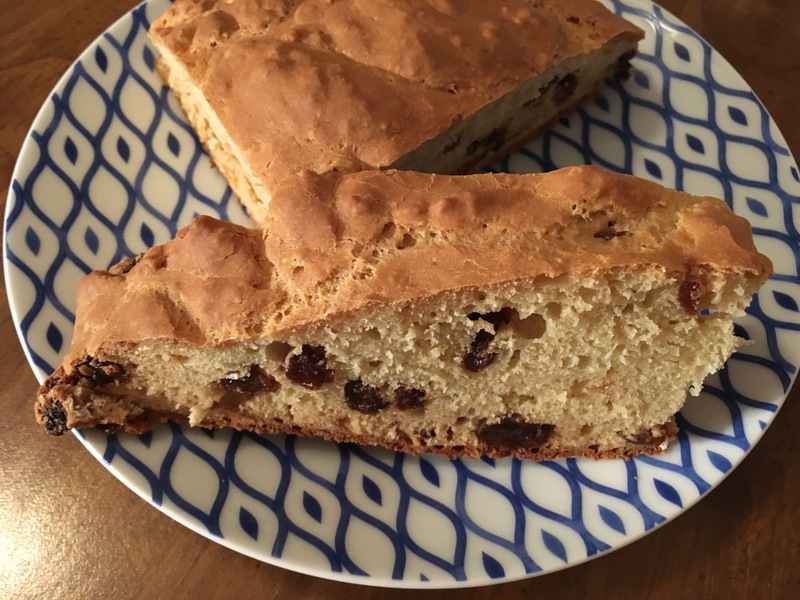 Definitely something I would make again, with raisins for a breakfast bread or without raisins to go with beef stew or the like.